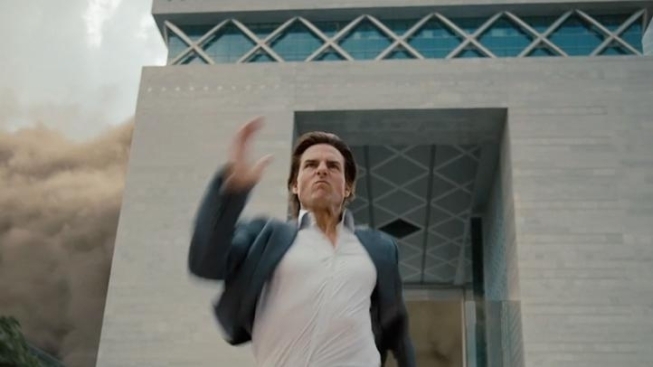 Director Brad Bird lured us in with the "Mission: Impossible - Ghost Protocol" teaser trailer which showed Tom Cruise dangling like a yo-yo from the top of the world's tallest building (the Burj Khalifa in Dubai). And now that we've got a full-length trailer, you can officially count us in. Not only does the action look insane (count how many times Cruise runs away from extinction-level explosions), but the cast list (though crowded) is at least packed with intriguing names. In addition to Cruise, you have Jeremy Renner, Simon Pegg, Tom Wilkinson, Josh Holloway, Paula Patton...all playing spy for the guy who brought us Pixar's "The Incredibles" and the criminally-underrated "The Iron Giant." Even though "Mission: Impossible 2" was straight-up bad (think Dougray Scott still wakes up in cold sweats thinking about how injuring himself on that film cost him the role of Wolverine in "X-Men") and "Mission: Impossible 3" was instantly forgettable (see? J.J. Abrams doesn't always spin gold), we have some hope that this installment could bring the franchise back around. And, hey, if you go see it in IMAX, you'll get to see the first six minutes of "The Dark Knight Rises." So it's win-win.